I run primarily for joy! I really started running the year I turned 39, more than 20 years ago, and I can still remember that feeling of accomplishment I felt when I completed my first mile. Fortunately, I have learned a lot about running since then. I have learned that running can test you and teach you. When my children were younger, running was the thing I did for me. I love the solitary nature of running, but I also love talking to other runners and sharing stories about runs and races. I am proud to say that both of my daughters have become runners, too. I ran consistently in my 40s and built up to regular 8 to 10 mile runs. Over the years I ran 5K and 10K races, and then I had knee surgery the year I turned 50. I worried that my running days were over, but over the course of the next year I began walking and then running again. However, it wasn’t until my older daughter said that she wanted to try running the Aramco Half-Marathon for Texas Center for the Missing that I even thought about trying it. When I signed up, I never expected to finish the entire 13.1 miles, but thought that I could run with her for a while, and stop when it became too difficult. To my surprise, even though it was cold and poured the entire race, we finished in under 3 hours. I have been hooked on doing the Aramco Half-Marathon ever since, and January 2019 will be my 7th time to run it. 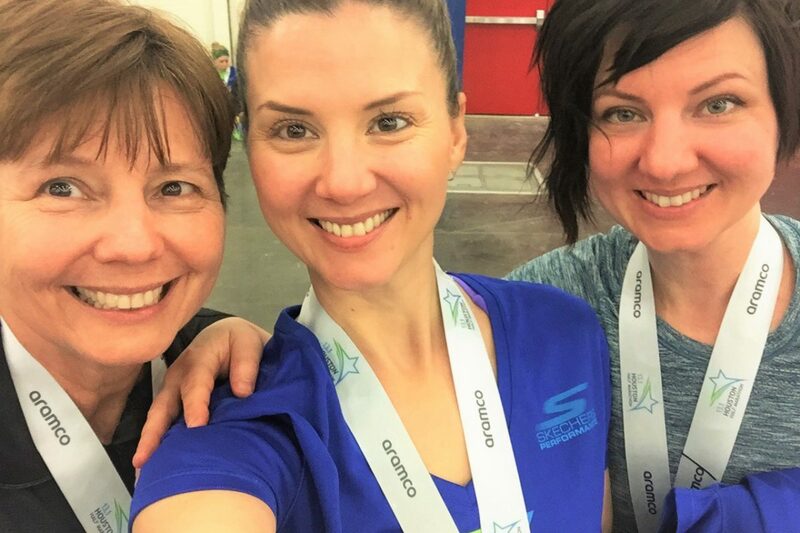 I love the sense of community I feel when I am at the Race Expo and on the day of the race – that shared sense of the possible! Since that first race my daughters and I have run 5 of the Aramco Half-Marathon races together. Now that I am in my 60s, I am facing some of the declines that come with aging, but I am hopeful that I have a few more races in me. I will not give up running without a fight. I still feel as though running is teaching me about myself. in the 2019 Aramco Half-Marathon or Chevron Houston Marathon! It Was A Hole-In-One! Allegiance Bank Pro-Am Golf Tournament raises over $65,000!